Most birders make a bee-line to Kaeng Krachan in Thailand, south of Bangkok, which has had a reputation as the easiest place to tick this species. For several years in the early 2010’s a pair was faithful to an easily accessible day roost; and probably hundreds or thousands of birders and photographers saw them there. I did as well and was shown the spot by a guide in early 2013. However, when I was back in late 2014 I was told by the same guide they were no longer there, having been driven away by too much pressure from too many visitors. So the easy tick is now gone. The field guides will show you the range is from peninsular Malaysia northwards to south-west Thailand along the border with Burma and crossing over into Burma. This is quite a small range not even extending into the Greater Sundas. With the increasing forest loss in this region, the population is considered Vulnerable. Most owls in peninsular Malaysia can be found even in parks and forested areas bordering urban environments, and these include the Barred Eagle Owl, Brown Hawk Owl, Sunda Scops Owl, Brown Wood Owl, Barn Owl, Buffy Fish Owl and Spotted Wood Owl. All of these owls have adapted fairly well to human presence. This is reflected in their conservation status as Least Concern. 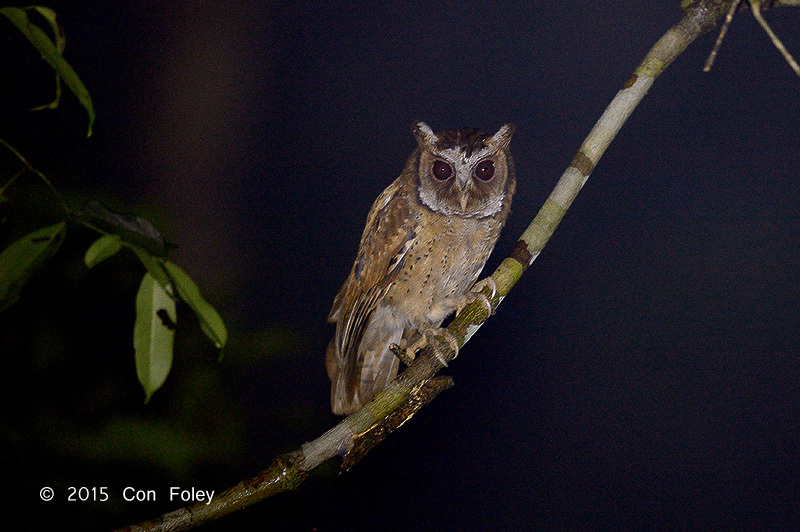 But not the White-fronted Scops Owl. 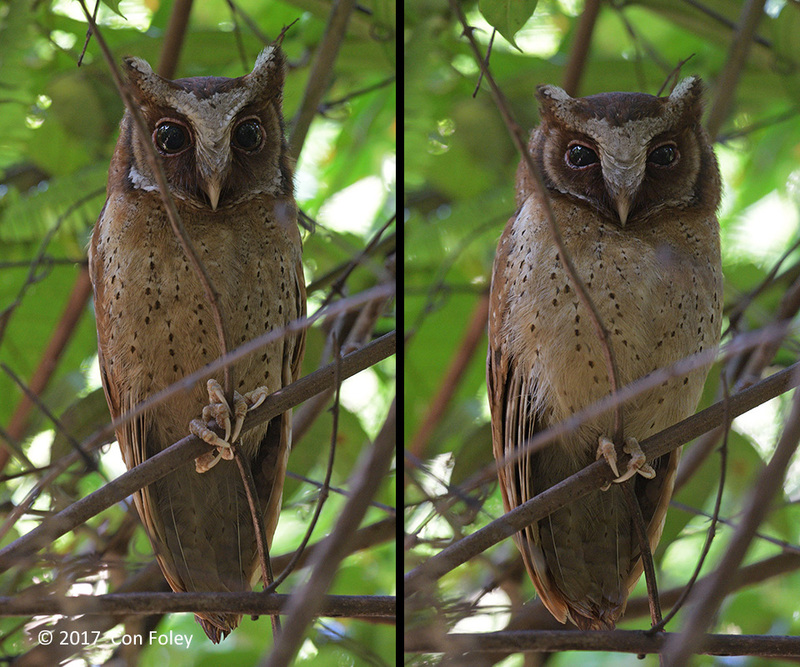 This species, as is the case for the Reddish Scops Owl, is a true jungle owl and appears to need good quality jungle habitat to survive. There are very few sites reported in peninsular Malaysia, with the research forest at Pasoh being historically the most significant, but Pasoh is not what it was twenty or more years ago. Wells documented 4 birds within a 15 ha block in Pasoh. So where it occurs, it may not be sparse. There are just a handful of records in Bird I Witness over the past 10 years, and none in eBird. Most of those records are from northern peninsular Malaysia, with sites in Kedah and Perlis having the most records. Birders often go back to the same sites and don’t so often explore new ground. Therefore it was with a great deal of surprise and pleasure that a bird was discovered this year in Johor, Malaysia. It was a whole lot more fun finding and observing this bird rather than being simply shown the bird as happened in Thailand. This is not the first record for Johor (I am aware of one other record), surely there are more birds waiting to be found. The owl was heard on two occasions prior to actually seeing it on a third occasion. This is key to finding many jungle species. First you must hear them, which presupposes that you know the call. So if you really want to see this species, learn the call, then spend a lot of time in good habitat before dawn or after dusk. And you may just hear it, and then you know it’s there. This species of owl calls well before dawn. When other birds first start calling as dawn is breaking, then it’s too late, this species goes quiet and is unresponsive thereafter. Having said all this, Wells suggests this species of owl does not vocalize as much as others. 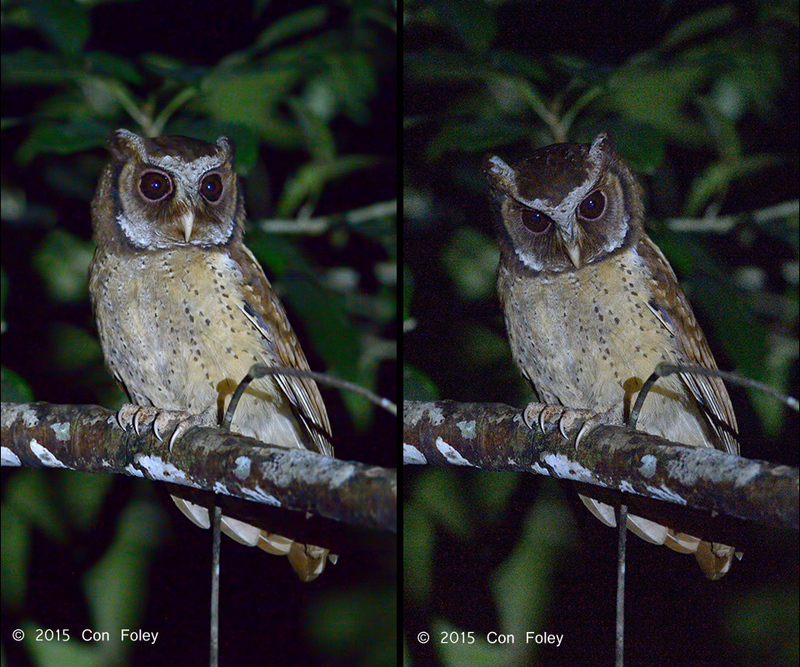 When you hear the White-fronted Scops Owl call, if you can hear it at all, that means it’s close; as the call is very soft. Then try following the call into the jungle. The owl will be calling from an open perch around 15-20 feet off the ground. You will have to bash into the jungle as quietly as possible in the dark. Check all the open perches at the height indicated. Listen carefully for the soft, but unmistakable call. If the call is even modestly loud, the owl is right above you! With luck you will find it as I did. Bashing through the jungle as quietly as possible, I stepped into a small clearing and there it was about 15 ft high on an open perch! It actually only took about ten minutes of bashing through the jungle to find it. This one stayed in view for at least a full minute, offering really astonishing and very rewarding views. The mistake you can make is playing tape and expecting the owl to fly out into the open. A few owls will come readily to tape. Not this one, you must go into the jungle and find it. So that means that folks with big cameras on tripods aren’t going to be able to sit on the road and expect to photograph this owl. It isn’t going to happen and tape isn’t the answer. There is just so little known about this rare owl, please treat it as if it was special. Considering that the pair at Kaeng Krachan got driven away by too much human pressure, I won’t say exactly where this sighting was. Now if there are birds in Johor and birds in Kaeng Krachan, no doubt there are birds throughout the range, which is likely fragmented. Most of the field guides have this as a lowland rainforest bird with few records from the slopes (Wells). From the lack of sightings, this species is likely to be local and sparse and restricted to good undisturbed forest. There are few observers who spend much time birding in the dense jungle, as opposed to the forest edges, so the true extent of this species is probably not known, and it may be a bit more common than supposed. As of the date of this post there are only 18 images of this bird in the Oriental Bird Club Image Database, and all of them are from Thailand with 17 of them being from just one park, Kaeng Krachan. Most likely many of these images of are the same bird at the same spot. 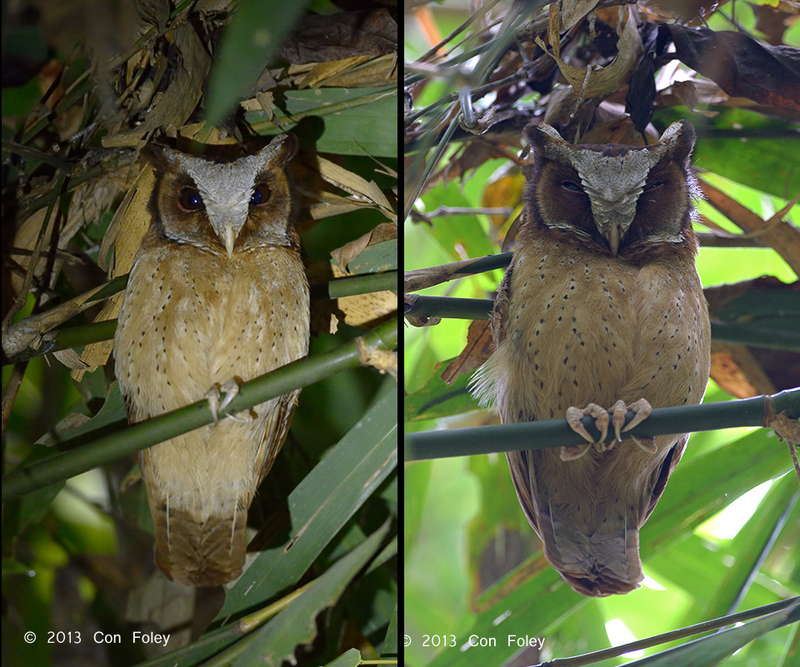 Here are two of my photos of this species in early 2013 from Kaeng Krachan. And here are two of my photos from Johor in 2015. The most prominent feature of the White-fronted Scops Owl is of course the prominent whitish area on the forehead and eyebrows. The Johor bird is clearly showing less whitish area than the Kaeng Krachan bird. It is interesting to consider whether we are observing a cline, or gradual variation, in the whitish area from near the northern limit of this species to near the southern limit, or whether we are just observing individual variation. But with so few photographs of this bird from Thailand, and many likely of the same bird; and no other known published photographs of this species from Malaysia it is simply not possible to answer this question. Future observers may wish to make note of this possibility. Recently I was lucky to see this species on a day roost in Johor. Here are a couple of images of the same bird. Robson, C. (2011). A Field Guide to the Birds of South East Asia. London: New Holland Publishers.